Seeing as the flights to and from New Zealand are each over eighteen hours (yikes), I thought I'd show you what I take with me in order to try and make the long flight a little bit more pleasant. 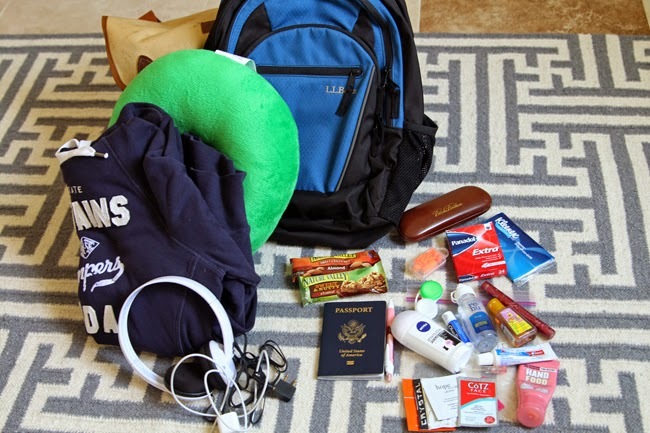 This is by no means the be all, end all of carry on packing lists. I usually end up bringing more than I intended and regretting it as I haul it through a big airport when I'm tired from traveling. Of course I never even get out half of those things on the plane, so this time I've stream-lined down to just the essentials! 1. The bag. I'm taking a backpack this time, just because I think it's easier to carry and it will be handy to have a day pack while I'm down under. 2. A neck pillow. For me this is an absolute must. It can make all the difference in the world to getting a bit of sleep and not having a sore neck when you arrive. 3. A sweatshirt (I'm taking this one from H&M). They insist on keeping the temperatures FREEZING on airplanes, so this is another must-have for me. 1. Headphones. The little earbud style ones hurt my ears (I have sensitive ears, haha) so I got this inexpensive pair that actually fit my small head! I also take a little airplane adapter (similar) incase the plane doesn't have a normal headphone jack. 2. Charger cables. It seems that more and more airplanes have USB ports in the seat so you can charge things while you fly. I also take this little charger (similar) that I can charge up, then keep on me to charge my phone or iPad if I can't get to an outlet. It's super handy! 3. iPhone. Even though this one is a glorified iTouch, I can read books on my Kindle app, play games if I get bored and I have a little point and shoot camera. 4. Passport...duh. 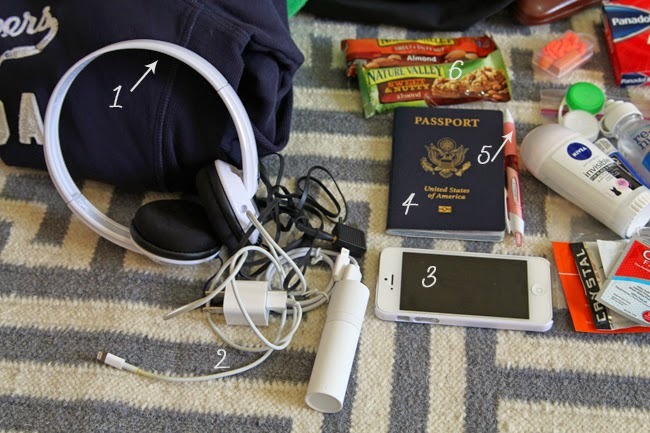 Also, even though it's not in the picture, I'll obviously take my wallet and sunglasses in my carry on as well! 5. A pen. Most countries require that you fill out landing and customs cards. It's so much more convenient to do this in the air so a pen comes in handy. 6. Snacks. I really, really don't like airplane food. My luck one option is either a stinky curry or unacceptable meat (I'm picky when it comes to meat) and the other option is smothered in cheese. (I've even tried requesting a vegan meal...still doesn't do it for me.) Occasionally I'll ask for just the tray to get the salad and dessert, but recently I've just started bringing my own granola bars or other healthy-ish snacks to tide me over until we land. 1. Glasses. It's not good to fly in contacts, so I always switch to glasses just before boarding. 2. Earplugs. Airplanes are noisy places, whether it's just the engines, the crying baby a few rows up or a nearby snorer. 4. Kleenex. Just in case! 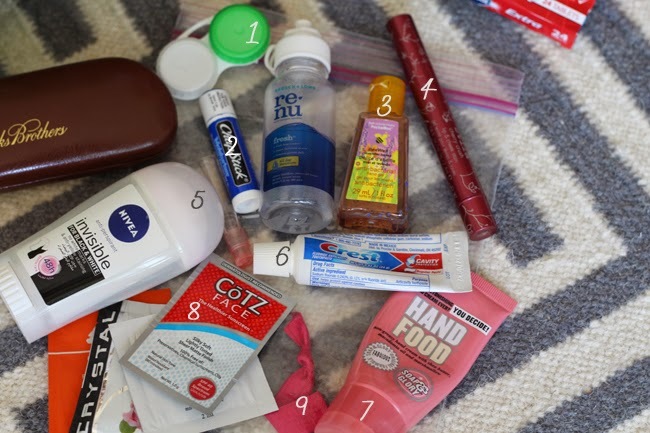 And last but not least, all of the liquids which are stored in a TSA approved ziplock bag! 1. 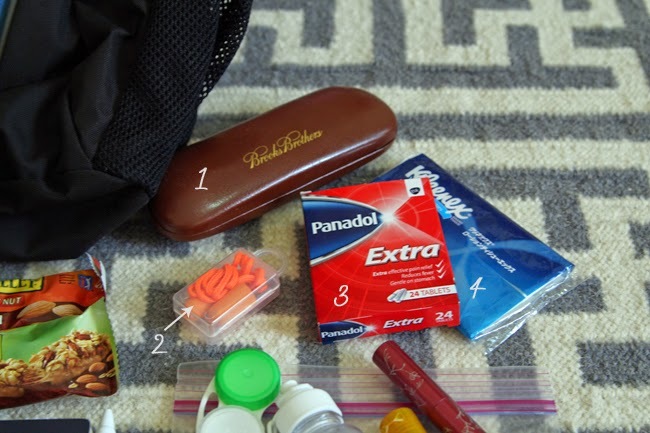 Extra contact lens case and contact solution. Like I said, I like to take out my contacts before I get on the plane. 2. Chapstick. The cabin of an airplane thousands of feet up is dry, dry, dry. 3. Hand sanitizer. We just can't trust that all those other passengers have washed their hands after touching who knows what, now can we? 4. Lip and Cheek stain. This is the only make up item I take on the plane with me. At least it gives me a little color when we arrive at our destination. 5. Deoderant and perfume. Eighteen hours is a long time to be sitting in one place, so for everyone's benefit I pack these two! I usually just grab whatever little perfume sample I happen to have laying around. 6. Toothpaste and toothbrush (not pictured). Again, no one can possibly have good breath after 18 hours. 7 & 8. Moisturizer. This goes along the same lines as the chapstick, it's SO DRY on airplanes. So, along with drinking tons of water to stay hydrated, I take some hand lotion as well as a few sample face moisturizers I have hanging around. Just because you're suffering in that seat doesn't mean your skin has to. 9. A ponytail holder. Or a hat for that matter. As nice as you might look getting on that airplane, eighteen hours later you're gonna want that hair tie or hat! 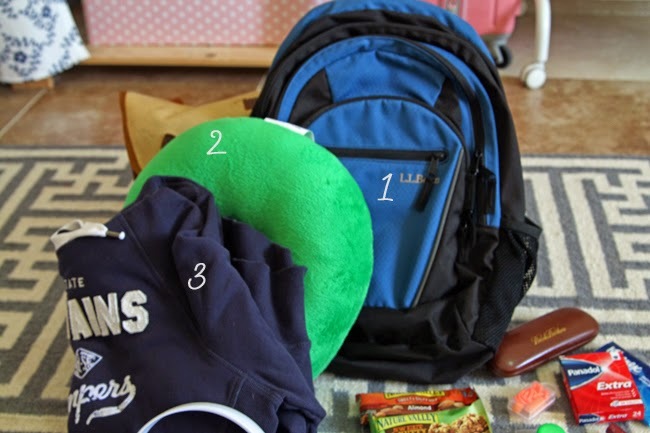 Well, I think that pretty much covers all the essentials! Fingers crossed these items will ensure I have a pleasant flight. 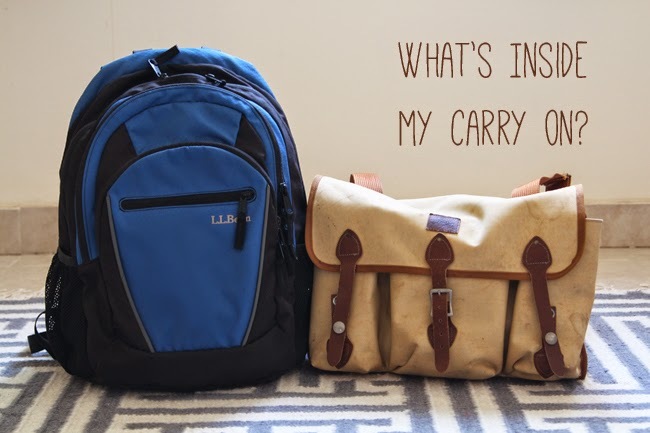 What are your carry on essentials?